This is even easier than my regular, throw everything in there, pot roast. I didn't have potatoes this time, so I made mash for it to go over. In a small bowl, combine the flour salt and pepper. Trim any large pieces of fat on the roast and coat with the flour mixture. Heat the oil in a large skillet and sear meat over medium high heat. You want a nice brown color on each side of the roast. Add more oil and lower heat if needed. Just so we are clear...I did not do any of that. I started here. Pour the soup into the bottom of the crock pot along with 1/2 can of water. Place roast in the crock pot on top of the vegetables. Cook on low for 10 hours. Slice or shred roast removing and big pieces of fat. Serve with some of the juice remaining in the pot or use the juice to make gravy and serve with the roast. 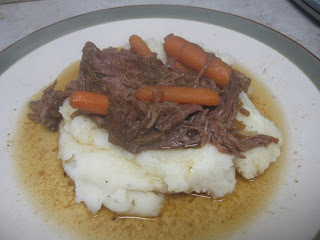 Looks like a great and easy pot roast recipe. Since discovering the healthier benefits of grass fed beef, I have been serving it more to my family. I found this post searching for roast recipes. I not only look forward to the pot roast, but to the leftovers of hot or cold beef sandwiches. Yum!